Small Gorilla beanbag plush stuffed toy ape. Made by Dan Dee International, Collector's Choice. 5" sitting. 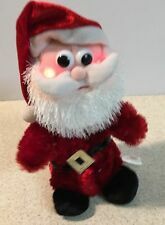 Christmas Animated Santa Musical Lighted Plush Stuffed Animal DanDee 9"
Works great is 9" tall. Animated musical and lighted. Won't disappoint nice animated Christmas. Do you have any more pictures available you can send?. Condition: Very Good Pre-Owned Condition; No obvious flaws. No stains or tears. Used for décor only. Dan Dee Puppy Dog Plush Pink Holding Satin Rose Heart Printed Bow Valentine 6"
Dan Dee Puppy Dog Plush. When putting the baby to sleep "Bare is Best" in the crib. Holding a pink satin rose. Wearing a heart print bow/ ribbon around neck. Starts off playing Pomp & Circumstance then continues on to "The Chicken Dance". The chicken dances and speeds up as the song goes on. This chicken is really cute! The bottom has minor normal spots from dancing and the "press here" spot has faded. Gingerbread Kids Plush with paper book/story about Candyland. Hello Honey Talking Teddy. However, we do make mistakes. So cute and fun for any age. New in box, box has wear. Colors: tan with pink bow. Type: plush dog. Dan Dee Frog Plush Toy. White potion of bunny ears is a plush material; pink portion is satin. Wearing white pink bunny ears. Green pink white. When putting the baby to sleep "Bare is Best" in the crib. New ListingDan Dee Sad Sam & Honey Basset Hound Plush Stuffed Animal Love Me Large 15"
Pre-owned Dan Dee Sad Sam & Honey plush dog. Dog is about 15"
Excellent, working condition. Ears flop, cheeks light up red, and sings a little diddy about the Easter Bunny. Batteries included. I did not open the battery compartment. See pictures for details. 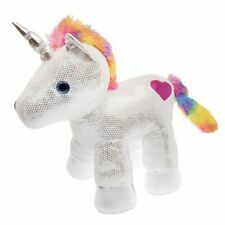 Really neat Unicorn stuffed head. This originally went atop a stick. You can put it on your own stick or stitch the hole closed to make a pillow or wall mount or whatever craft project. Tested and this works. Sings Hey Hey we're the Monkeys and moves side to side. Dan Dee Christmas Reindeer Sock Monkey. Sings and Moves Side to Side. Requires 3 AAA Batteries. CHOCOLATE MOOSE. PLUSH DOLL. SUPER SOFT. Very good used. bean bag seat to sit up. Adorable Pink Plush Puppy Dog from Dan Dee. All new material. Polyester fill. No odors, pet hairs, stains, holes, markings, broken seams or parts. If not pictured, not included. Quite possibly the best, cheapest, or only one like it currently listed. Button batteries if needed in item are always included.often new ones. Dan Dee Orange Cat Plush SCREAMS 4" Tall Halloween Stuffed Animal. Condition is New. Shipped with USPS First Class Package. 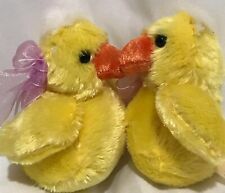 A cute fuzzy little duckling that quacks when you squeeze it. Dan Dee Duck is all ready for his bath with his robe and rubber ducky. Robe is original but rubber ducky added just for fun. Super soft and a great surprise for Easter. Large Caterpiller - 29" long. This is in overall good condition. There are no serious flaws. This cute little guy is by DanDee Collector's Choice! My son has Asthma & I would never put another child at risk for an attack. It is a fox. Great used condition: Has a light flaw or more than a little piling, wash wear, fading, etc. Smoke and Pet Free! Ears Flop while song plays. Great working condition. Dandee Sock Monkey Plush Large Giant Oversize Boy Stuffed Animal 48” Condition is Pre-owned. There are no stains or tears on the Monkey he looks to be well taken care of. Shipping from a smoke and pet free home. The Sock Monkey is in great shape and as you can see in the photos he is sitting in a full sized recliner. If you have questions please ask! Thanks for stopping by and looking! Dandee~Brown SLOTH 12"~Plush Tic-Tac-Toe Heart Red Bow Stuffed Animal! This is in good condition and works great. DanDee Pink Easter Bunny Rabbit Plush Security Blanket Rattle Satin Knotted 15"
Dan Dee Green Frog Wearing Pink Bunny Rabbit Ears stuffed/plush - 14"
7” the item in the photo is the actual product you will receive. Very Clean. Perfect for Easter. Pink and White with dress and bow. Dan Dee Collector's Choice Elephant Plush Stuffed Animal Toy Gray Pink Hearts 9"
Dan Dee Collector's Choice Elephant Plush Stuffed Animal Toy Gray Pink Hearts 9". Condition is Used. Shipped with USPS Priority Mail. Owl colorful plush toy pink green blue small 6" stuffed animal bird Dan Dee 6"
Preowned stuffed plush small Owl by Dan Dee. Dan Dee Sad Sam & Honey Basset Hound Plush Stuffed Animal Love Me Large 15"